More than three miles of stream which flows through the South Korean capital of Seoul has been uncovered and restored after half a century of being channeled through an underground tunnel. The Cheonggyecheon was part of what inspired the king of the Chosen Dynasty to select Seoul as its new capital 600 years ago. But the stream was covered in concrete as the city industrialised in the 20th century. Earth News. 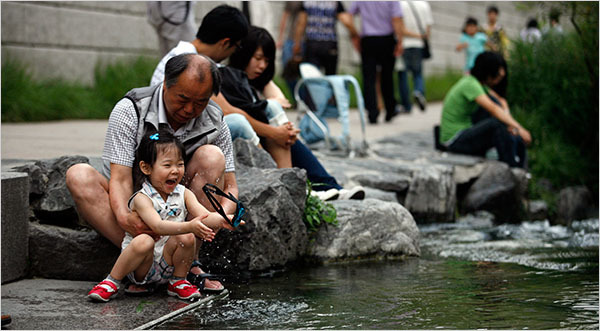 Now, a $384 million recovery project ahs liberated the Cheonggyecheon. A number of other the world’s urban waterways have been similarly restored, or there are plans afoot to do so. Cities from Singapore to San Antonio have been resuscitating rivers and turning storm drains into streams. In Los Angeles, residents’ groups and some elected officials are looking anew at buried or concrete-lined creeks as assets instead of inconveniences, inspired partly by Seoul’s example. By building green corridors around the exposed waters, cities hope to attract affluent and educated workers and residents who appreciate the feel of a natural environment in an urban setting.